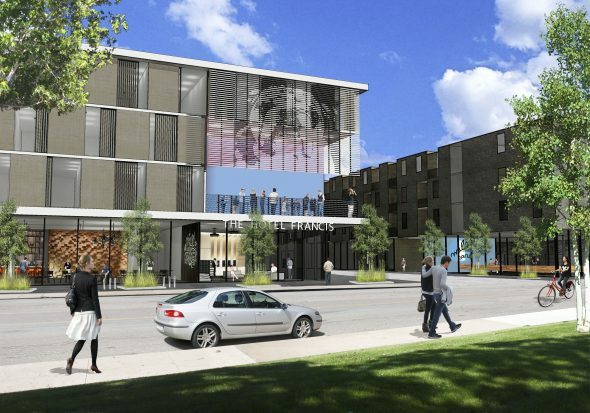 The proposed boutique hotel dubbed Hotel Francis (a name inspired by Drake University founder Francis Marion Drake) is part of a new development planned by Nelson Construction & Development. Plans for the mixed-use project also include retail, apartments, and row houses. Drake University has agreed to sell two parcels of University-owned land to Nelson Construction & Development, which plans to build a hotel, market-rate apartments, and urban-style row houses on the site. Initial conceptual renderings from the Des Moines-based developer also call for retail spaces and parking on the site, which boasts spectacular views of Drake’s iconic Old Main. 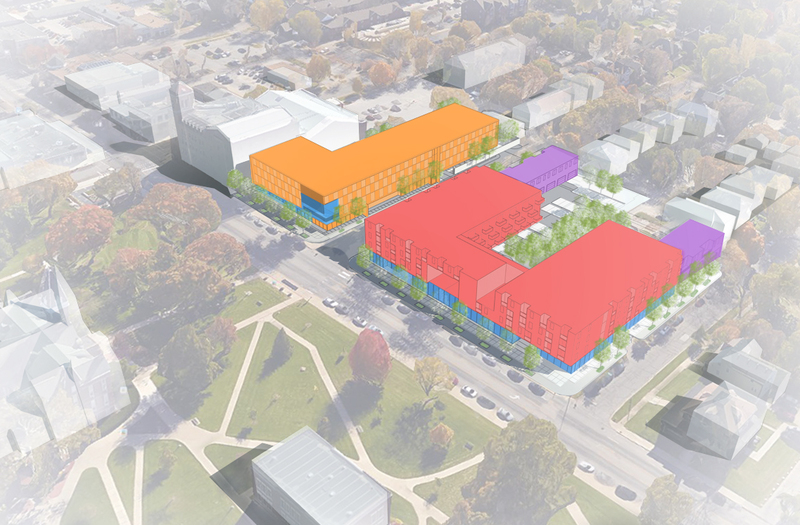 A conceptual rendering shows a hotel (orange), apartments (red) and row houses (purple) as part of a planned development by Nelson Construction & Development along University Avenue. Proposed retail is in blue. Drake sought proposals from 11 Iowa firms to develop 2.65-acres of University land, which neighbors First Christian Church on the south side of University Avenue and crosses 26th Street on the west. 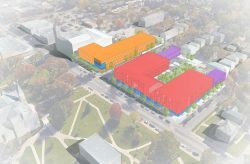 Drake University President Marty Martin said Nelson’s proposal aligns with the University’s vision for development in the Drake Neighborhood. Nelson’s early conceptual design renderings show families walking and bicycling along a manicured streetscape on 26th Street, with a modern, upscale hotel on one side of the street and the apartment building and urban-style row homes on the other. The project complements construction efforts that are well underway on the north side of campus. The $52 million STEM@DRAKE project adds two new buildings to campus, both of which are expected to open in fall 2017. The buildings will be home to labs, classrooms, collaborative spaces, offices, and other features related to several of Drake’s science programs, as well as the Drake University School of Education and the Robert D. and Billie Ray Center. The ground floor of this mixed-use apartment building would feature retail on the ground floor and parking along University Avenue. 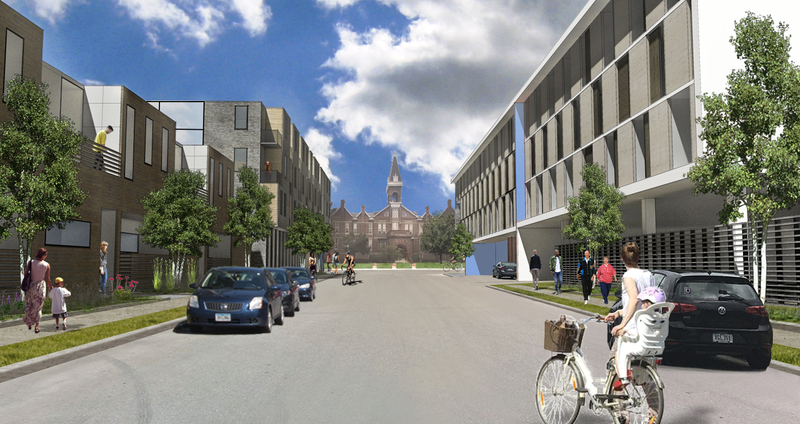 Early conceptual design renderings show families walking and bicycling along a manicured streetscape on 26th Street, with a modern, upscale hotel on one side of the street and the apartment building and urban-style row homes on the other. The view along University Avenue, looking east from 27th Street toward the proposed development.